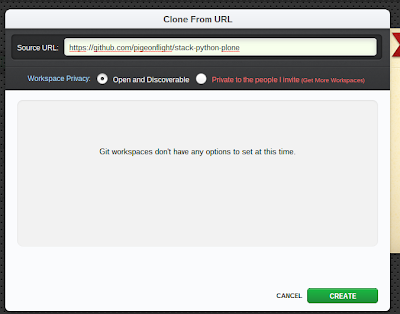 update: July 31, 2015 My recommended approach is to install Plone on Cloud9 IDE. update: July 24, 2013 This no longer works as Dotcloud has retired their free sandboxes. I've documented a way to run Plone in the Cloud with Nitrous.io. 5 to 10 minutes of spare time. Have your login information for both Cloud9 IDE and Dotcloud close at hand. Log in to Cloud9 IDE and from the dashboard select "Create new workspace" > "Clone from URL". This will generate a live Plone instance on dotcloud. Your Plone site is named based on your dotcloud account name and your dotcloud instance name. If you used the name 'plonedemo' and your dotcloud account name is 'scotty', then your Plone url will be: http://plonedemo-scotty.dotcloud.com. Make a note of your admin password. Visit the appropriate url using your webbrowser and log in using the credentials from the output of the above command. It isn't entirely production ready out of the box, but works very well for learning Plone - and with a little configuration it could be production ready. Hmm.. this is not bad, though it does add a barrier to students in my region who are likely to not have a credit card.